In the morning, I have been listening to Addie Ottley’s Morning Show using the TuneIn Radio app mainly because it is an upbeat show that doesn’t cover all the same horrible stories you hear everywhere else. 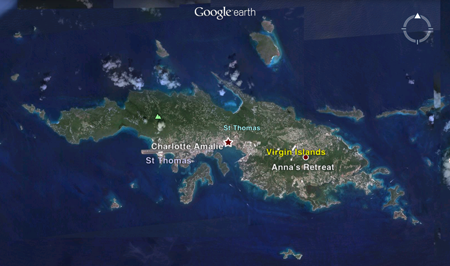 The show is from WSTA 1340 “Lucky 13 Radio” from St. Thomas in the US Virgin Islands. I really dig this show because it is so different and so happy. Addie is not overly bubbly or gregarious, in fact, he is very monotone – but he comes across as a trustworthy friend just chilling with you in the morning. They do birthday announcements and there is a drawing for a free cake from one of the show sponsors. There is also a word of the day read by a local student. Today was dogmatic – I just love this kind of stuff. I heard a commercial for St. Thomas Toyota and immediately thought, “Really? A Toyota dealership on an island?” The island is only 32 square miles so is there enough business for an entire dealership? It must really cut down on car theft though. Think about it… in 32 square miles (most of which is undeveloped) you would have no place to hide a stolen vehicle. Even if you stashed it in a garage for a while, the odds of the owner (much less police) seeing you drive past are pretty darn good. Our habits (and crimes) are totally dependent on geography (and other issues.) Here in Texas, the Department of Transportation will store large piles of sand, gravel and other road construction materials on the side of highways. Because of the easy access, I have heard reports of people stealing a truckload of sand for a home project. That just isn’t an issue in Death Valley, California. The market for stolen sand just doesn’t exist there. Strange things you think of early in the morning. NextSarcasm – good fun or subtle evil?